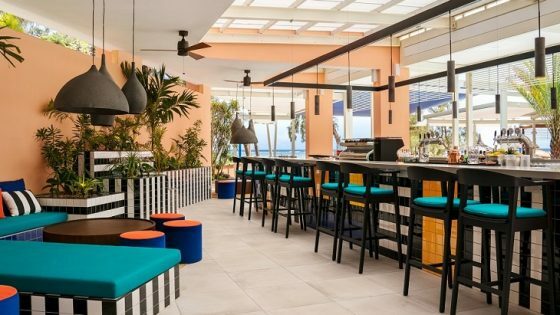 The trail-blazing Dutch hotel group citizenM will open two exciting new hotels in Paris this summer including a hotel in the heart of Paris”s business district, La Défense and a flagship property opening in August in central Gare du Lyon. 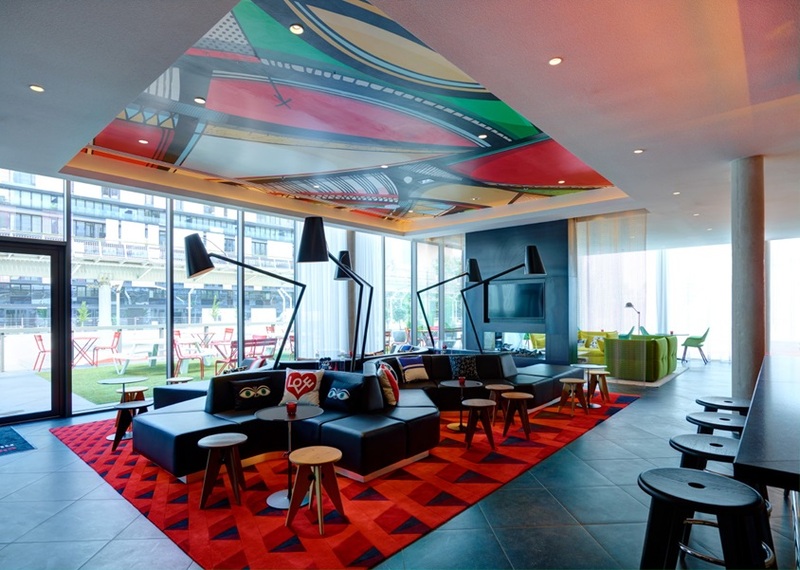 With its existing hotel at Charles de Gaulle airport, citizenM will now have three hotels in Paris all offering affordable luxury, smart technology and clever design. citizenM La Défense is now open within the bustling business district of Paris, located to the west of the city. La Défense, best known for its iconic arch-shaped building, the Grande Arche, is currently undergoing a major revamp, complete with sprawling terraces and gardens, new avenues and towers, organic restaurants and fashionable bars. At the ground level entrance guests are greeted by coffeeM, citizenM’s own coffee bar concept which was first introduced at the Tower of London flagship last year. This vibrant space has been adorned with a ceiling fresco featuring a repeat-pattern of Andy Warhol photo-booth selfies. societyM meeting rooms are located next to coffeeM and provide wonderfully creative environments which are perfect for hosting meetings and workshops. 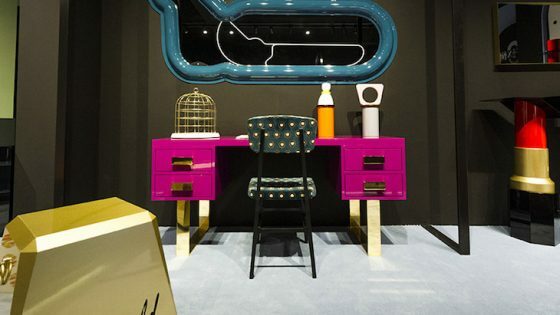 The breakout space features a playful Parisian kiosk. From here, two escalators, a new design element for citizenM take guests up to the Check In and Living Room. 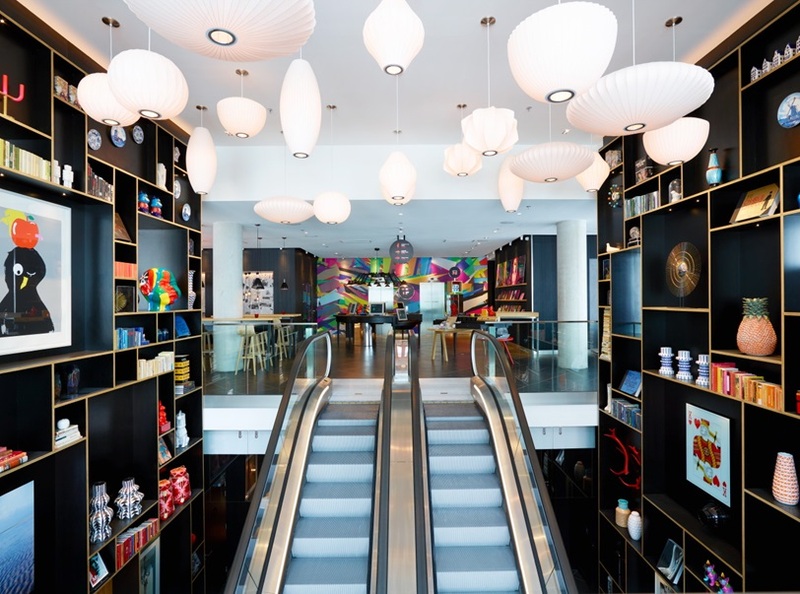 Alongside each escalator is citizenM”s signature shelving, featuring a range of colourful and quirky objects, from Eames birds to artworks, books and curiosities. 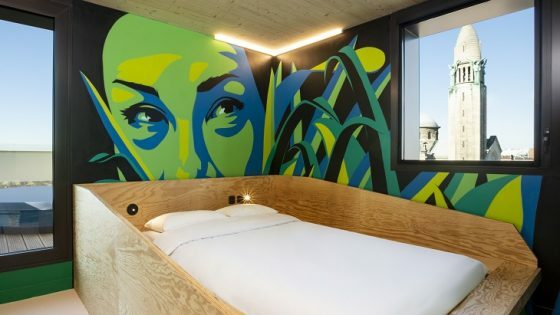 The elevator up to the Check In is cladded from ground to first floor with a bespoke mural by Paris and NY based AVAF, an artists” collective who have previously created pieces for citizenM Bankside and Shoreditch. The Living Room is the heart of citizenM, providing space to work, eat and socialise. 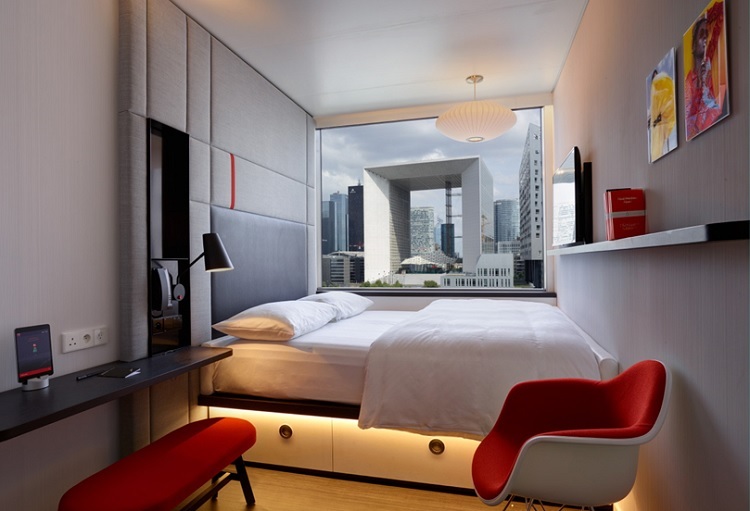 At citizenM La Défense, the Living Room is on the first floor and enclosed by a glass façade with a large terrace. The Living Room also features collectionM, citizenM”s retail component offering easy travel accessories, inspiring gifts and books. Here another piece of bespoke fresco adorns the ceiling, created by local artist Romain Froquet. canteenM forms the lively heart of the public area. Together with intimate booths and communal tables this is the place to drink, eat and meet. With a design nod to French cuisine and its reliance on traditional copper pans, the walls here are clad with copper.